Ozone (O3) is of crucial importance for the equilibrium of the Earth atmosphere. 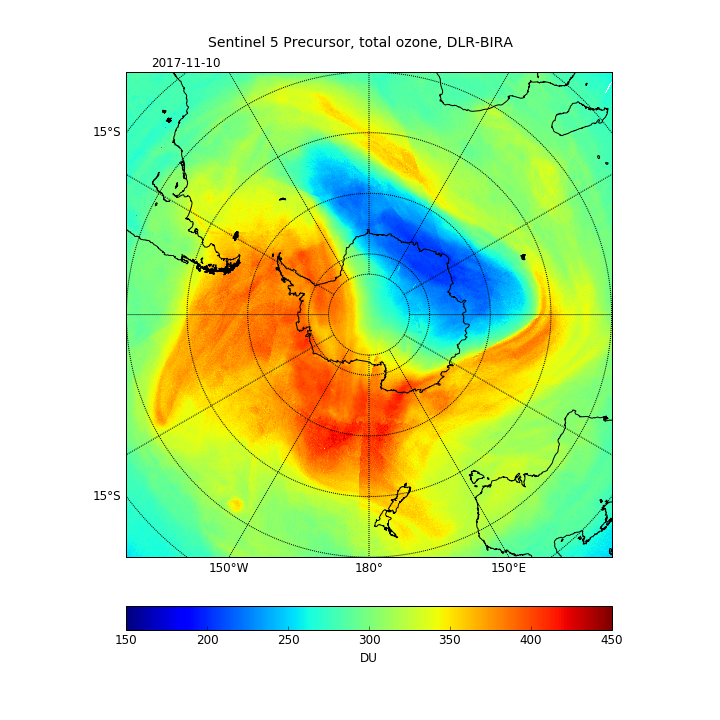 In the stratosphere, the ozone layer shields the biosphere from dangerous solar ultraviolet radiation. In the troposphere, it acts as an efficient cleansing agent, but at high concentration it also becomes harmful to the health of humans, animals, and vegetation. Ozone is also an important greenhouse-gas contributor to ongoing climate change. Since the discovery of the Antarctic ozone hole in the 1980s and the subsequent Montreal Protocol regulating the production of chlorine-containing ozone-depleting substances, ozone has been routinely monitored from the ground and from space. For TROPOMI/S5P, there are two algorithms that will deliver total ozone: GDP for the near real-time and GODFIT for the offline products. GDP is currently being used for generating the operational total ozone products from GOME, SCIAMACHY and GOME-2; while GODFIT is being used in the ESA CCI and the Copernicus C3S projects. Here below you can see an example of the Antarctic ozone hole from 10 November 2017, shortly after TROPOMI began making measurements. Data Product Version Summary (click the highlighted version number for latest PRF for the NRTI and OFFL data products). Links to the Algorithm Theoretical Basis Document (ATBD), Product User Manual (PUM), and the Product Readme File (PRF) is provided here on the right under Documentation. Note: the NRTI version of this data product was publically released on 11 July 2018, the OFFL version released in October 2018, and both are available via the Copernicus Open Data Access Hub (see link on right).